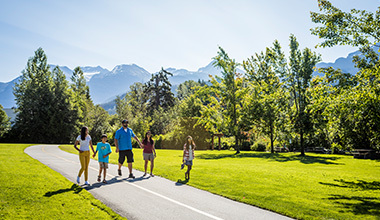 The Valley Trail connects all Whistler's neighbourhoods from Function Junction in the south to Emerald in the north, passing through the Village, Upper Village and Creekside as well as other residential areas on the way. The Valley Trail connects to the Sea to Sky Trail and is part of the Trans Canada Trail which connects thousands of communities across Canada. Download the Whistler Valley Trail Map. The Valley Trail is a multi-use network shared by cyclists, walkers, runner, dog walkers and skateboarders. Here’s a few tips for using the trail so all users can enjoy the trail safely. The Valley trail follows the same rules as the road - Canadian-style! Stay to the right of the yellow centre line. Lower the speed to vacation pace so you have plenty of time to stop or change direction if the unexpected happens (like spotting a squirrel). Keep an eye out for other users when overtaking, entering, leaving or crossing the trail. Give plenty of warning when overtaking other users. Bikes and runners can be pretty quiet, so use your bell or voice to give walkers polite notice you are coming past. Keeping your pooch on a short leash next to you means they can't wander across the trail unexpectedly - great for their safety and the safety of other users (there’s plenty of great dog parks along the Valley Trail where they can run free). Retractable leashes can be hard to see, so consider a full leash. And please pick up after your pooch - there’s bins and bags placed at handy locations along the trail. They are usually most active early and late in the evenings and you will occasionally see them crossing the trail. Check out our tips for what to do when you see a bear ahead of time. Pull off to one side if you stop to look at a map or a view so other people can get past. Click on the following to see some suggested routes including distances and maps, with ideas on things to see and do along the way. You can also link sections of the Valley Trail with local transit to reduce walking and riding time. Just 20 minutes from the Village by bike, Rainbow Park by Alta Lake is a favourite spot for fun in the sun. There is a sandy beach, lots of grassy areas, picnic tables, beach volleyball courts and a floating dock for lounging on after a refreshing swim. From the Village head to Whistler Golf Club (the entrance is located off Whistler Way, by the Whistler Conference Centre). Take the underpass under the highway then take the Valley Trail path to the right of the clubhouse. Follow the signs to Rainbow Park, turning left at the River of Golden Dreams. Cruise along this flat section of trail to Rainbow Park, keeping an eye out for people paddling kayaks, canoes and stand-up paddleboards on the River of Golden Dreams along the way. A great loop for joggers, runners, walkers, kids and strollers with beautiful scenery. Quiet and serene, you’ll pass golfers perfecting their swing while being surrounded by truly awe-inspiring scenery of white-capped mountain peaks and lush forest. This loop starts and ends near the Whistler Golf Club clubhouse. The entrance to the Whistler Golf Club is located near the Whistler Conference Centre - take the underpass under the highway to find the clubhouse. Go either north or south on the Valley Trail from here to start the loop. Things to See: Bears often share the golf course with the golfers so keep a look out on the greens for some of Whistler’s most famous residents. You can also see other wildlife and birds, views of the surrounding mountains, giant cedar trees and whimsical sculptures. Can you spot them all? 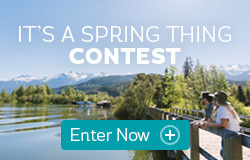 Starting from Creekside, take a tour of three of Whistler’s beautiful lakes – don’t forget your swimsuit! There are two different routes to get to Meadow Park Sports Centre, located at Alpine Meadows north of the Village. For a fun loop go out via Lost Lake (unpaved sections) and return to the Village following the River of Golden Dreams. This route can take you past two lakes, a water park, parks and playgrounds with opportunities to swim and play. Pack a picnic lunch and make a day of it! View our suggested winter walking routes in our Insider's Guide to Whistler Winter Walks. The Valley Trail remains open year-round and is a wonderful way to experience Whistler's winter wonderland. See frozen lakes, snow-covered trees and views to the distant mountains in their white winter coats. View walking routes on our Insider's Guide to Whistler Winter Walks. The Resort Municipality of Whistler works to clear and maintain sections close to the Village which may be suitable for walking, running or fat biking. Other sections are groomed for cross country skiing on a regular basis. Please note after heavy snowfalls there may be a delay in clearing the trail and not all sections of the Valley Trail are regularly maintained. For up-to-date trail conditions and advice check with the Whistler Visitor Centre on arrival. You can view the snow clearing routes on the Resort Municipality of Whistler website. Ditch the car and discover the magic of snow with these winter walking routes around Whistler.